It's not too often that I make up a 'repeat' of a pattern I've designed. But I was rather happy with my teddy bear, and felt the urge to 'jazz' him up a bit. I followed the same pattern (available on my site on my salepage: http://www.crochetsal.com/salepage.html) , but used a larger hook and one strand of worsted weight with one strand of eyelash held together. I had a couple of plastic animal noses on hand that, quite by accident, wound up being the perfect size. 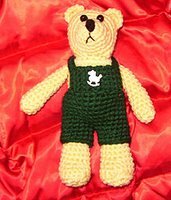 The Valentine Teddy Bear I have listed at http://www.craftmall.com. 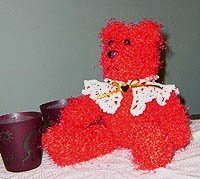 She is $15.99 US for the finished bear, and includes shipping. I will also take orders for other colours. As for the arm warmers my daughter sooooo wanted me to make? They were finished Sunday, and have yet to see the light of day. Um...have yet to see the light of the camera flash now that I think about it!